3 electrostatic filter bags with 3 notches - 3 sacs filtres électrostatiques à 3 dents 3 electrostatic filter bags with 3 notches for Cyclo Vac central vacuums. 3 sacs filtres électrostatiques à 3 dents pour aspirateurs centraux Cyclo Vac. 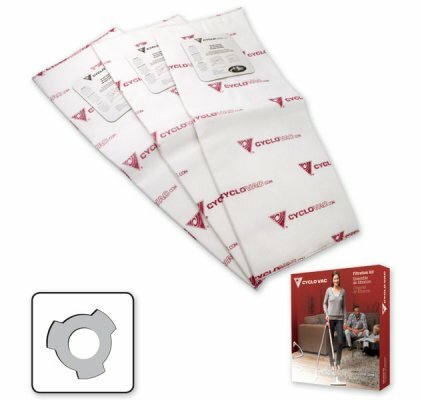 Package of 3 short electostatic filter bags for Cyclo Vac central vacuums. These disposable bags with 3 notches ensure constant maximum vacuum power, no matter the volume of dust inside. For the GS95 and GS115 models.